​If dogs are Man's Best Friend, then your Golden Retriever puppy deserves nothing less than the best start in life you can give! 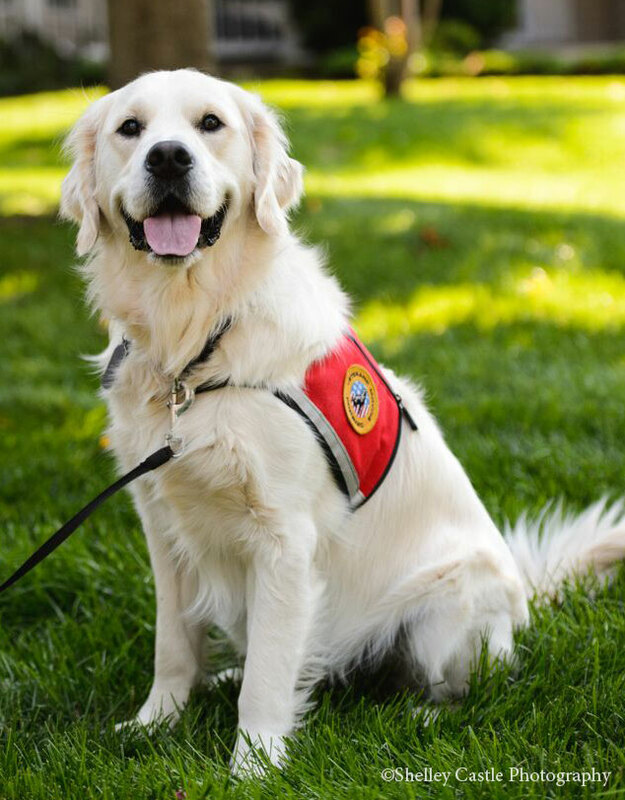 Companion, Comfort and Therapy, Emotional Support, and Service Dogs all have a job to do, but without the right tools, they won't reach their potential. A reputable breeder commits to providing the right tools for your puppy during the most critical periods of their life. Learning occurs faster during the first four months than any other period of your Golden Retriever's life - which is why we have built our program on The Imprint™. "A wise man cares for the needs of his animals"
Nothing can replace the benefit of careful, skilled, and controlled imprints for your puppy during those critical 16 weeks. No other time is as valuable and once lost, is lost forever. Our imprinting practices are based on years of experience, reputable programs such as Puppy Culture, as well as performance in the field of service, therapy, emotional support, and companionship. ​Click to visit The Imprint™ page. ​We spent a great deal of time researching options when we decided we wanted to add a puppy to our family. ​Luke and Lucy have exceeded our expectations on every level. To say we love these two is a total understatement. We cannot wait to see how they grow and mature. What I'm fortunate to have in my life now, thanks to the process Snitker Goldens use is a calm, more relaxed puppy that still loves the outdoors, but is super well mannered with almost no additional training as of yet that can come with me to the office. She was completely un-phased when a garbage truck followed by a city bus roared past! She just sat and watched. I knelt down beside her anticipating a “startle” but she just looked at me like I was daft! (Mom, stop worrying about everything, she said!). I am STUNNED by her brilliant performance on-leash!!! Darby is so smart it is kind of scary. She has the ability to learn and remember things almost instantly without repetition. I actually taught her to lie down at class by simply saying down one time and pointing with my finger. We are soon to embark on her formal education to be a therapy dog. Read more Referrals from our families. Even with the best imprint, a breeder cannot create what is not already present, which is why we are continually seeking to better the breed. Our Snitker Golden Retrievers complete medical testing and health clearances before breeding which includes hips, elbows, eyes, heart, Ichthyosis, prcd-PRA, PRA-1, and PRA-2. With the emphasis of our program being that of the working dog, we watch for characteristics in our selected breeders to embody this. We want our Golden Retrievers to show a willingness to work for their handler and the drive to learn - all paired with an exceptional temperament and excellent health, so that we can provide the best genetic potential for your puppy. We're located in the heart of the Midwest in the northeast corner of Iowa, close to the Minnesota, Wisconsin, and Illinois border. Most of our families fly into the Minneapolis airport, while some do choose O'Hare in Chicago. We're within a reasonable driving distance from Des Moines, Cedar Rapids, Dubuque, Rochester, Madison, and have plenty of families who still make the drive up from Kansas City, Missouri or Omaha, Nebraska areas. We've even hosted families who decide to make a sight-seeing trip out of their pickup and drive all the way up from Texas. Training a puppy from eight weeks old to adulthood takes a huge amount of time and energy, but the benefits of a well-trained adult are well worth the effort! We understand that not every family has that time and energy, but they still deserve to enjoy a loving Golden Retriever in their home. Gold Select puppies start their specialized training with us at eight weeks of age and continue to your desired level of training. We have two training options available. To learn more, please visit the Gold Select™ page. Completed her Gold Select Puppy™ and is currently training to become a service dog for her family. Currently serving as a therapy dog and companion Golden. Currently enjoying life as a companion Golden for her family. In Iowa, the word barn is synonymous with our heritage and the legacies of Iowans before us. It felt only natural to label our custom designed facilities as the "Dog Barn" and the "Puppy Barn". Though it is doubtful there are many dog barns quite so house-like! With outdoor runs boasting over 30,000 square feet of open space - we're proud of the care and facilities we raise our beloved Golden Retrievers in. We're now seeing other breeders adopt our concept of bringing the home to the puppy, which began in 2008​. This concept has completely revolutionized our effectiveness to train your puppies in a controlled and positive environment, making their transition to their forever homes a smooth one.